As Tsvangirai lay dying in a posh hospital in South Africa on a fully government funded health trip, against all African ways Nelson Chamisa was in the arms of the soon to be widow scheming on ways of grabbing power from the rightful people. He had done his mathematics correctly. He strengthened his plot by bringing in his friends in crime Tendai Biti and Job Sikhala and a bunch of those Tsvangirai had expelled from MDC. Chamisa was so determined to grab power such that he turned the party security to be his thugs and comrades in crime. As is common with all dictators any person with a descending voice was fed to the vanguard to receive some very violent lessons. As his prayers were answered Chamisa celebrated as his boss Tsvangirai breathed his last on the 14th December 2018. He consolidated his power and used the funeral of Tsvangirai to beat up any contenders. Senior MDC members were fired the likes of Obert Gutu Khupe and a lot. Chamisa rendered MDC very weak with his power hungry and dictatorial tendencies. Dictators make it happen, It happens because of weak institutions, crisis of legitimacy and absence of consensus or polarization. If the party is weaker than the leaders well…things can happen. Not all dictatorships happen in quite the same way. We must separate and distinguish military dictators which are quite common from ideological and political dictators. Chamisa is an ideological and political dictator. Mussolini came to power by means of an organized gang called Fascists which staged a massive rally that intimidated the government. So like Musolin Chamisa used the violent gang called the vanguard. MDC T was weak enough to be swayed by him. If they had crushed him early and often, that would be the end of him, but the MDC T felt insecure and threatened because of the death of Tsvangirai lack of spoils, the rise of vanguard and so on. CHAMISA came to power by NO democratic means. 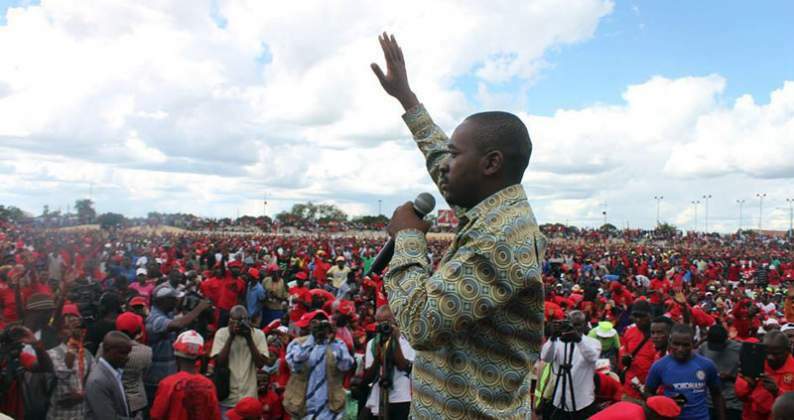 As a none democratically elected leader, getting absolute power-was no easy feat for Chamisa. He then abused the poorly paid vanguard and changed all the structures. He disregarded all the procedures whic made MDC a democratic outfit. He created rings around himself to sustain his prolonged iron rule. With Biti and Sikhala in the fold Chamisa rekindled the old student days. He picked all former student leaders to join him in the onslaught against democracy. In order to escape from an internal election he hid behind the pending elections and exercised one man decisions in order to maintain a grip on power. As a typical dictator he expanded his power base through nepotism and corruption. He coopted those he wanted and fired those he feared. He appointed Biti as his deputy without taking the matter to congress. This was because his own appointment was dubious. This is not just a tactic adopted in the MDC the powerful will always find ways to abuse their privileges. Be warned, though: you will eventually be rumbled, so corruption tends to work only in the short term. SOONER or later Chamisa will sit to count and lick his wounds. Better make sure to surround yourself with loyal kin who you can trust to do what's best for you and your family. So Chamisa congested the corridors of power with his trusted criminals. Long serving and faithful MDC stalwarts were elbowed and sidelined. Chamisa Instigated a monopoly on the use of force to curb public protest He elecated the thugs in uniform called the Vanguard to a security team. He would even inspect a guard of honour while dreaming of power. e lesson: Better make sure to surround yourself with loyal kin who you can trust to do what's best for you and your family.So Chamisa started to rule MDC by force. Most bonafide members were kicked out. MDC changed from MDC T to MDC Alliance. Small opposition parties were sucked into the big tent. They only realised that they are being played for fools when it was too late. Indeed when given the choice in an experiment, people will desert an unstructured group (analogous to an anything-goes society) and seek the order of a "punishing regime," which has the authority to identify and reprimand cheats. Any aspiring dictator who restores order, even through coercion, is likely to earn the gratitude of his people. SO Chamisa's fame ballooned. In order to buy loyalty chamisa used the donor's funds to buy respect. Curry favour by providing public goods efficiently and generously. Benevolent dictatorship was practised by Lee Kuan Yew, prime minister of Singapore for 31 years. This what Chamisa did within MDC. Lee believed that ordinary people could not be entrusted with power because it would corrupt them, and that economics was the major stabilizing force in society. To this end, he effectively eliminated all opposition by using his Unconstitutional powers to FIRE suspects without trial without the right of appeal. To implement his power grab Chamisa allowed only one spokesman. Chamisa started telling people about The lesson: Restore the economy, develop large infrastructural projects that create a lot of jobs and it will strengthen your power base. But he never told anyone how that would have been achieved. He started getting rid of his political enemies - or, more cleverly, embrace them in the hope that the bear hug will neutralize them. Thus Chamisa took the lesson: Keep your political enemies close to you. Dictatorships feed on wars and other external threats because these justify their existence - swift military action requires a central command-and-control structure.So chamisa turned people against government institutions. He made people hate the constitutional court. The police and so many institutions. He had to oppose anything without any reason. The lesson: Start a war when your position as leader becomes insecure. Chamisa then started manipulating the hearts of the people. This was in the spirit of Accumulating power by manipulating the hearts and minds of your citizens. he promused airports lied abiut trump lied about everything. He became a proper dictator. One of the first actions of any aspiring dictator should be to control the free flow of information, because it plugs a potential channel of criticism. Chamisa have the advantage of all private media. The lesson: Control the media or, even better, own the media. It's as simple as that. The lesson: Build buildings and erect statues in your honor, and get the Church on your side. So Chamisa became a pastor and created the Chamisa chete chete mantra. 2018 is coming to an end Chamisa was born in 2018 as a worse Dictator than Hitler was. He is an orator whose mind is clouded by power. His ascendants to the MDC helm was never democratic. He lost to Mwonzora and after gossiping to Mrs Tsvangirai about Mwonzora Chamisa was given a life line by unconstitutionally elected vice president. Ge then shook Tsvangirai to death by wrestling the power from him. A dictator in the making. Zimbabwe does not need a leader who disregards the very constitution he is is supposed to guard.